Supermassive black holes can really mess you up if you get too close. When that happens to stars, they are ripped apart, releasing an incredible amount of energy. We have been able to spot the flaring from this event directly before, and now two new studies have seen its effects on the surrounding area. The energy of this stellar tidal disruption heats up dust that surrounds the supermassive black hole, making it shine in infrared. Astronomers can see these sudden changes, called light echoes, and these studies have been able to spot four of these echoes. This is not just an astronomical curiosity. By measuring the amount of light emitted by the dust, the scientists were able to estimate the energy of the flare with a greater precision than ever before. "This is the first time we have clearly seen the infrared light echoes from multiple tidal disruption events," said Sjoert van Velzen, a postdoctoral fellow at Johns Hopkins University and lead author of one of the studies, in a statement. Van Velzen’s study, available online and to be published in the Astrophysical Journal, looked at five possible tidal disruption events and saw light echoes in three of them. A fourth light echo was reported in an independent study by Ning Jiang, a postdoctoral researcher at the University of Science and Technology of China. This light echo was the reverberation of light from the ASASSN-14li flare that was observed last year. Studying light echoes doesn’t reveal information about the flare, but it provides useful information on what the environment around the black hole is like. In particular, black holes appear to be surrounded by a spherical patchy web of dust located about half a light-year from the "hole" itself. 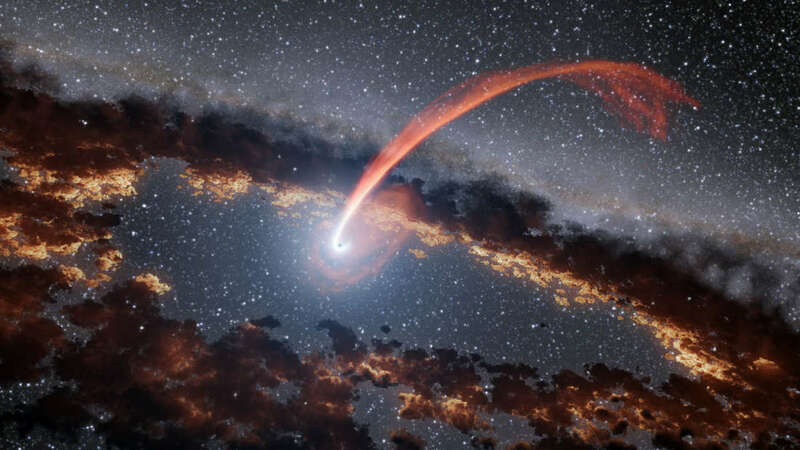 "Our study confirms that the dust is there and that we can use it to determine how much energy was generated in the destruction of the star," said Varoujan Gorjian, an astronomer at NASA's Jet Propulsion Laboratory in Pasadena, California, and co-author of the paper led by van Velzen. Both studies were possible thanks to data from NASA's Wide-field Infrared Survey Explorer, which was launched in 2009.